We now have the ability to reconstruct the weather on any particular day as far back as 1900 (at least) by combining our modern weather forecast models with the available measurements from the day in question. But, the further back in time we look, the more uncertain we are, as the available observations become fewer. Let’s start with a modern example. Exactly 100 years after the death of Queen Victoria and the Herøy ‘hurricane’ (and a week after wikipedia was launched), we can reconstruct the weather patterns remarkably well. 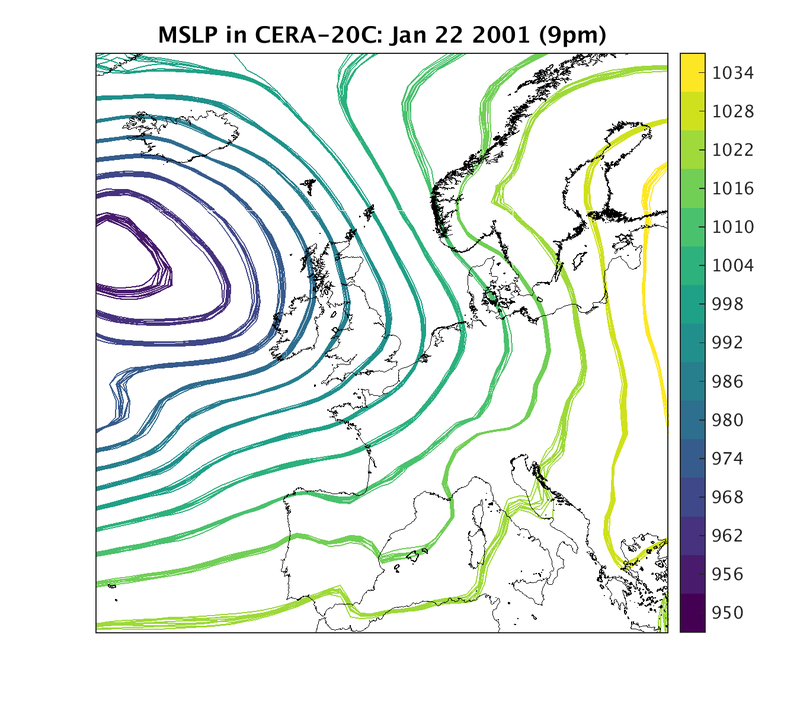 The map below shows ten sets of lines (from the CERA-20C dataset), each representing a possible pattern of isobars (or lines of equal sea level pressure) for the evening of January 22nd 2001. They all agree that a typical low pressure Atlantic storm is approaching north-western Europe. Ten simulations of the sea level pressure pattern from the CERA-20C reanalysis (contours). However, for the evening of January 22nd 1901, the situation is rather different. The different sets of lines do not agree, apart from in the broad sense that there is high pressure over France and low pressure to the north. Ten simulations of the sea level pressure pattern from the CERA-20C reanalysis (contours). Dots are new observations from the Daily Weather Report (DWR). An animated version is available (large file). Currently there are not enough available observations to constrain the atmospheric circulation pattern any better. But, the large coloured dots are the newly rescued measurements of MSLP for this day by the volunteers from the Weather Rescue project over the past two weeks. Those points outlined in orange or red indicate large disagreements with the CERA-20C reanalysis dataset. This is why the new rescued measurements are so important – they will dramatically improve our reconstructions of the weather on this day, and every other day we collect the data for. As for the Herøy ‘hurricane’, it cannot have been a true hurricane as they are only found in the tropics, but the Arctic region can generate very small and intense storms. There is also currently no sign in the reanalysis of an intense storm over western Norway, although the new observations do indicate lower pressures on the morning of 22nd January, especially in Bodo (around 50km to the north of Herøy). We are hoping to persuade the teams producing the CERA-20C dataset, and other similar datasets, to repeat this small part of the simulations, adding in the new Weather Rescue data to see the improvements. Edited on 17/12 to reflect the new information about the Herøy storm identified by commenter ‘lacunaec’. Thankyou! Previous Article Phase 1 complete! There were wind related damages in S-Iceland the day before. The cera20 is a long way from resolving individual windstorm events in a satisfactory manner – but with more real data it will grow better. – I find that the c20v2 is slightly better, at least it is usually shows broadly what is going on. We are now at a dangerous point – people are already using the reanalysis datasets as they are representing a truth. Input of more real-world data is imperative. Thanks Trausti – yes, the long reanalyses are often unfortunately used as truth, and sometimes even just the ensemble mean rather than considering the ensemble members which is also wrong in my view. Hopefully this new data can dramatically improve the situation over Europe at least, and the other data rescue activities happening worldwide can make similar advances. Is Herre in southern Norway the location, I see references to a https://no.wikipedia.org/wiki/Sandsundv%C3%A6rulykken Sandsundværulykken in Herøy (Nordland) on the date with the same number of casualties? Hi Lacunaec – yes, that looks very likely – well found! The region on wikipedia is probably wrong and should say Herøy. The village is around 50km south of Bodo – one of the locations listed in the Daily Weather Reports, and Bodo does have a low pressure observation the morning of the storm. Will edit the post to reflect this – thankyou!